This is a vigil for the billions of individuals whose lives are shattered for the palate pleasure and amusement of consumers whose taste for animal suffering trumps justice and compassion. It is a protest, a rejection of, and a necessary remedy for, the mockery that animal welfare advocates, "conscientious" consumers, and "humane" farmers have made of the word 'respect'. It is a direct response to "RESPECT YOUR DINNER", an HSUS sponsored event where participants are invited to experience the superior taste and texture of "humanely" enslaved, and "respectfully" murdered animals. As participants will be "Hoofin it" around Denver for four consecutive days, savoring the burned remains of a different animal each day—a bison, a pig, a lamb, a calf—we will stand in solidarity, in sympathy, in outrage, and in deep sorrow with the animals whose lives, hearts, minds, memories, languages, and unique identities will have been obliterated into the ugliness of meat. Join us in opposing the elitist notion that other animals exist for human use. Join us in celebrating the mind, the heart, the mystery that each sentient being brings to the world. Joins us in restoring the true meaning, practice, and moral significance of word 'Respect'. Live vegan and educate others about the vegan imperative. THIS SOLEMN MOMENT IN THE LIFE OF A FREE-LIVING BISON COMMUNITY IS A GLIMPSE INTO THE RICH INNER LIVES OF BISON, AND A POIGNANT LESSON IN THE TRUE MEANING OF RESPECT AND DIGNITY. 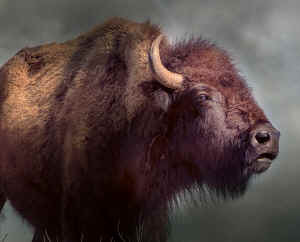 THE BISONS' ACTIONS STAND IN SHARP CONTRAST TO THE DEGRADING NOTION THAT OTHER ANIMALS ARE MINDLESS, EMOTIONONESS OBJECTS OF HUMAN USE, AND REVEAL THE DEPTH OF THEIR UNDERSTANDING OF LIFE, DEATH, LOVE, AND LOSS. LET THEIR VIGIL SHOW THAT THE INDIVIDUAL WHOSE FLESH WILL HAVE BEEN SERVED AT EVENTS LIKE SUNDAY NIGHT'S DINNER WAS SOMEONE WHOSE DEEP CAPACITY FOR LOVE, LOYALTY, EMPATHY, SORROW, AND JOY WOULD HAVE INCLINED HIM TO SEEK MEANINGFUL BONDS AND RITUALS TO COPE WITH LOSS. Storm clouds were gathering in the distance as the pregnant bison walked away from the safety of her herd and started searching for a secluded spot to give birth. She moved quickly, nervously, with an urgency in her step increased by the threat of the approaching storm and the perils of being alone and away from the protection of her mates at her most vulnerable time. But there was no hesitation in her person. She advanced with intent and resolve. She had a purpose and a destination. After hours of labor, the crocuses of the baby's translucent hoofs finally pierced the air, then came his muzzle, his head, then the whole of his soft body slid into the world cocooned in a shroud of blood and water. Overflowing with love for her brave thumb of a child who had so trustingly left the perfect world of the womb for this world of splendor and sorrow, she forgot her exhaustion, her hunger, her thirst, and jumped up, licked the infant's body clean, then nudged him gently with her nose to help him to his feet. His small body bent and folded obediently with each nudge but did not rise. She continued massaging him with vigorous strokes of her tongue, pushing him up again and again. But he was not moving, he was not responding to her touch, he was not breathing. He rested lifelessly on the ground, the still pools of his eyes reflecting a darkening sky they could not see. If she understood that her baby was dead, she refused to accept it. She continued her attempts to revive him and, as her efforts became more frantic, as her struggle to quicken the stillness out of his body with the rasp of her tongue covered his body in dark trails of spit and breath, her soft grunts started to sound like sobs. By midday, when snow began to fall, she finally stopped trying. She folded herself down on the ground and rested next to her son, her flank almost touching his. From time to time, she licked his face faintly but she no longer hoped for a response. Soon, the other bison ambled in one by one, gathering around the lifeless infant. They sniffed him intently, they nudged him with their noses as if to wake him, they gently pushed him to his feet with their their hooves. They moved slowly, deliberately, with reverence and a sad knowing, grunting softly as they understood that the newest member of their family was dead. Then they formed a loose circle around the bereft mother and her stillborn baby, bedding down in silent vigil, and permitting no one to approach the site or disturb the baby's remains —not the ravens, not the wolves, not the bears—until the funeral was complete. They stayed there a long while, silent knowledge flowing from mind to mind, and, in the living fortress of their presence and protection, the mother, too, would be undisturbed in her vigil. She would say good bye a little while longer, she would kiss the child's face a little while longer, she would keep the snow from covering the frozen pools of his eyes a little while longer.